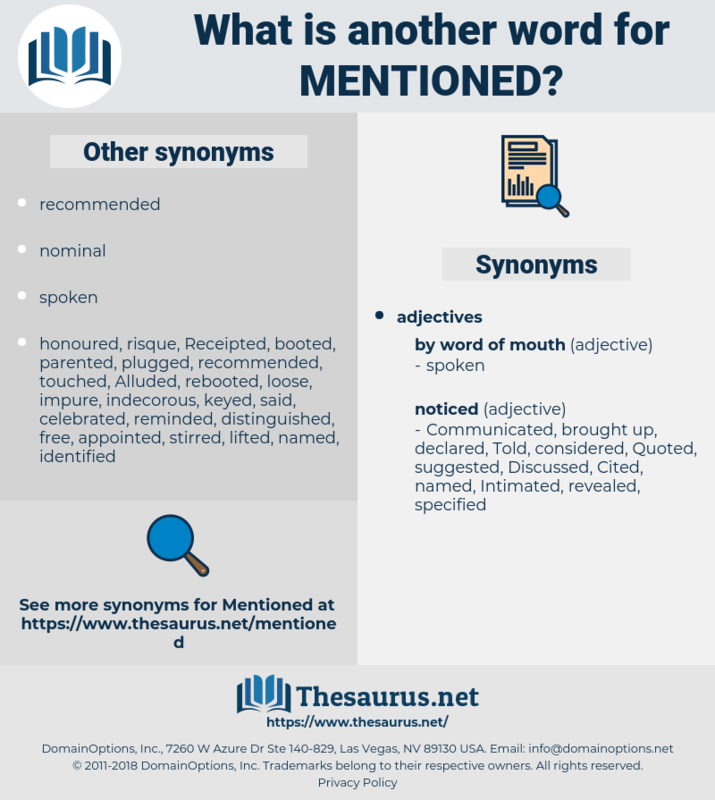 What is another word for Mentioned? referenced, stated, noted, above, aforesaid, above-noted. Indicating, pointed, acknowledged, menioned, nominated, notice, noticed, Quoted, suggested, implemented, outlined, Commemorated, Questioned, remind, Explained, informed, Opined, demonstrated, Communicated, Invoked, Reiterated, Inserted, Commended, Told, disclosed, Wrote, highlight, highlighted, Cautioned, Testified, Attributed, involved, emphasise, emphasised, confirmed, admitted, recognized, emphasize, emphasized, contained, Contemplated, Remarked, initiated, Hinted, item, Encompassed, directed, included, Summoned, discovered, Notified, opinion, imposed, Introduced, illustrated, implied, Manifested, appointed, advertised, summarized, Contended, Examined, reaffirmed, recommended, moved, interviewed, Enumerated, Instituted, described, promised, addressed, issue, Issued, underscored, estimated, announced, o, touched, determined, Alluded, elaborated, Contributed, articulated, recorded, briefed, presented, measure, Termed, asserted, monitoring, revealed, concerned, concerning, Insisted, remembered, understood, celebrated, conveyed, signify, Submitted, underline, underlined, stressed, come, Came, recounted, speak, spoke, reflected, registered, propose, proposed, voiced, Appeared, repeated, Began, Enshrined, observed, contacted, related, concluded, supported, formerly, Benefited, advised, pronounced, exposed, clarified, affirmed, Entered, to, increased, assumed, welcomed, Discussed, Tackled, HIT, used, covered, pledged, Deemed, Offered, Meant, Argued, Met, Resembled, Warned, perceived, rule, ruled, turned, Provided, Voted, posed, Signaled, signalled, Gave, Responded, established, expressed, defined, evoked, greater, Envisaged, affected, found, conducted, declared, advanced, treated, Targeted, sustained, classified, Followed, Transferred, featured, tabled, Delivered, added, focused, talk, talking, Talked, more, lifted, Was, Were, Answered, thought, Aimed, received, Undertook, maintained, names, read, reproduced, Rendered, saw, alerted, Filed, Arose, Claimed, held, Believed, Replied, Leaked, showed, considered, or, Stating, OJ, Relied, named, Returned, Occurred, Brought, broached, faced, Enunciated, Launched, pursuant, Attracted, Approached, Visited, handled, agreed, Displayed, marked, set, relayed, ranked, -, status, Had, heard, Asked, Wished, cast, called, Happened, Reached, shared, felt, placed, Served, Flagged, led, put, plus, fell, Surveyed, drew, produced, Dealt, released, dated, Jo, planned, decided, Resumed, expected, sought, Took, desired, Got, Adduced, requested, Her, Did, tried, made, al, referenced, Cited, stated, noted, listed. 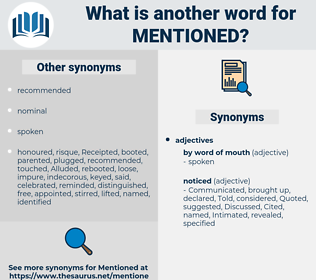 mentionned, comments, Omitted, incorporated, envisioned, pointed, acknowledged, nominated, noticed, Quoted, suggested, implemented, outlined, constitution, Explained, informed, demonstrated, Communicated, Invoked, recognised, Inserted, written, Told, disclosed, highlighted, Inventoried, involved, Denoted, emphasised, confirmed, implicated, recognized, emphasized, witnessed, contained, document, documented, documents, distinguished, standardised, Contemplated, initiated, Hinted, detailed, Encompassed, condemned, designated, completed, directed, included, Summoned, discovered, Notified, imposed, available, Introduced, illustrated, implied, Manifested, appointed, circulated, advertised, Inferred, administrator, summarized, Contended, evidenced, Examined, reaffirmed, recommended, moved, depicted, Enumerated, Instituted, prohibited, guaranteed, ascertained, Praised, silence, described, Inspected, addressed, issue, Issued, donated, underscored, Promoted, estimated, announced, Caught, associated, o, touched, determined, Alluded, Activities, elaborated, Mooted, measured, articulated, anticipated, located, monitored, recorded, presented, represented, endorsed, Termed, Advocated, asserted, article, Forwarded, labelled, Comprised, summarised, revealed, concerned, Insisted, remembered, understood, transmitted, denounce, Denounced, governed, Hesitated, collected, spoken, Submitted, Probed, underlined, stressed, come, publicised, speak, reflected, printed, targetted, registered, proposed, embodied, voiced, portrayed, Appeared, withdrawn, Exhibited, repeated, impacted, Enshrined, observed, contacted, related, concluded, supported, quiet, foreseen, advised, Incurred, pronounced, compelled, exposed, clarified, Explored, accepted, Replicated, selected, assigned, Entered, proved, proven, increased, assumed, altered, Looked, Discussed, linked, delineated, supposed, instructed, Tackled, realised, used, covered, shot, Deemed, Offered, Meant, known, Argued, Met, formulated, certified, predicted, Warned, ruled, Provided, given, restated, Voted, posed, Signaled, signalled, cleared, forecast, Responded, established, Counted, inscribed, Helped, expressed, fixed, defined, refined, evoked, Regarded, detected, Envisaged, affected, executed, enrolled, approved, found, strengthened, ordered, attached, conducted, declared, advanced, prescribed, analogous, treated, Targeted, Borne, engaged, sustained, classified, Followed, projected, protected, featured, tabled, Delivered, added, focused, talk, talking, Talked, regulated, spelled, chosen, lifted, Lodged, Answered, Adhered, seen, warranted, published, Undertaken, retained, Picked, thought, Aimed, filled, angel, gathered, received, Subjected, Generated, Exported, maintained, Arisen, read, reproduced, Rendered, needed, ISCED, elected, deferred, Echoed, Viewed, Filed, us, Captured, Claimed, Singled, Emerged, held, spearheaded, Replied, Deployed, stamped, learned, Been, considered, or, Relied, named, regained, Returned, accessed, scheduled, Occurred, Assessed, Brought, left, broached, faced, reviewed, processed, Enunciated, Expelled, Launched, Attracted, previous, Approached, gone, Debated, relieved, handled, Upheld, Boarded, Achieved, agreed, driven, Displayed, marked, set, suited, agency, ranked, Supplied, Surfaced, required, text, Audited, laid, -, have, Has, posted, status, applied, Had, tracked, failed, heard, Asked, cast, Shown, Rated, called, Happened, B, dropped, Reached, shared, felt, developed, placed, Served, Flagged, drawn, Carried, led, put, pursued, prepared, Surveyed, taken, produced, Dealt, higher, released, Caused, Dubbed, planned, decided, Resumed, expected, exchanged, fallen, Passed, sought, Numbered, desired, Created, headed, Got, Adduced, funded, requested, done, controlled, based, made, referenced, stated, noted, listed.
" I wonder Valmai never mentioned you to me," she said. So, speaking of girls, I'll tell you about the one I mentioned. motown, medan, mean time, manawydan, muhammadan, mountain, median, methane, medium, maintain, medina, madame, mithan, manawyddan, momentum, menadione, montana, myodynia, minden, mundane, methadon, Mutawa'een, muhammedan, Maundy Money, mdma, monition, maiden, maianthemum, myotonia, mitten, matinee, modem, midden, Mindanao, Mount Whitney, mountain anemone, meatman, mantineia, maintenon, mid-may, meditation, mow down, Mount Etna, monotony, mediation, montanan, methionine, maiden name, Mt Etna, madman, mouton, mentum, meantime, moth-eaten, mutiny, matman, mid-on, methadone, myotomy, mutation, madam, mahatma, mohammedan, mud hen, muadhdhin, madden, manhattan, muton, minuteman, mantinea, mountain man, mentation, metonym, Mandean, montane, monotone, menhaden, Mandaean, monodon, madonna, mutton, methenamine, metonymy, munition, man-to-man, madwoman, motion.